Adventure golfing is a great recreational activity for the entire family. Everyone from the preschooler to Grandma would love for a chance to putt around. The Pirates Cove Adventure Golf course in Lake Buena Vista promises oodles of fun to everyone from ages five and beyond. Located at The Crossroads in Lake Buena Vista in Florida, the two 18-hole golf courses bring back to life the world of the 18th century pirates. Mischievous buccaneers come out to play as you put around with your entire family or a group of friends. Young children can also learn a little about the story of some of the most famous and, probably, feared pirates such as Blackbeard as you go through the course. Also available are several pirates’ merchandises like eye patches for the kids and the kids at heart who want to further their pirate experience. Pirates Cove Adventure Golf is known for their award-winning landscapes. The entire course is well-kept and features several obstacles, which add entertainment to the entire family. Pirates Adventure Golf in Lake Buena Vista showcases several waterfalls, caves, and wonderful landscaping to bring to life the adventurous existence of pirates in the 18th century complete with a pirate ship on the lagoon with a regularly booming canon. Guests can come and choose from two courses — the easier one or the harder one. For those who are up to it, you may even choose to play the two courses! Keep in mind, though, that when things get a little busier around certain times of the day, you may have to wait in line for your time to putt. For questions, the staffs at the Pirates Cove Adventure Golf are only too willing to assist you in your needs. Many guests have remarked that the staffs of this mini golf course have always been very helpful, polite, and approachable. It does enhance the entire experience to know that you can approach its people with your questions and expect assistance and great service. Guests have been coming in to Pirates Cove Adventure Golf and leaving highly entertained for many years now. Not only it is a great way to spend with family and soak up a bit in the buccaneer culture, but the course really aims to provide its guests with the best mini golfing experience they could get. 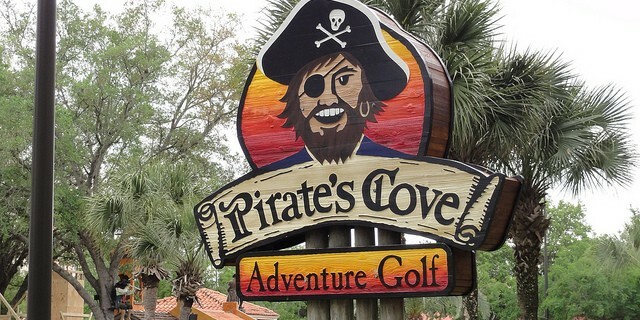 Recently, Pirates Cove Adventure Golf was also awarded by TripAdvisor its Certificate of Excellence and was voted as the best adventure golf in Florida but you could get no better recommendations than the glowing comments of its guests. Indeed, if you are looking for a great way to spend several hours with the entire family or a whole flock of friends, this destination in Lake Buena Vista is one of your best bets. Pirates Cove Adventure Golf is open every day from 9 AM to 11 PM the whole year round. It is situated rather conveniently in the Crossroads Shopping Center. To play either the Captain’s Course or Blackbeard’s Challenge charges adults $10.45 and children ages 4 to 12 years old $9.45. Children under the age of 4 years old can play for free.